Purbeck District Council: Darryl Howells has won an appeal for the redevelopment of a site in Lytchett Matravers, for the demolition of existing building and erection of a shop unit with 1 no. ground floor flat and 2 no. flats above and detached block of 2 no. 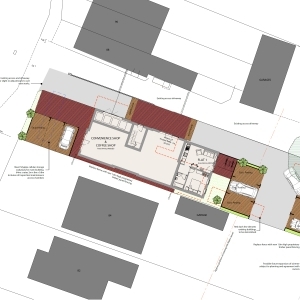 bungalows with associated works to existing access onto Wareham Road and surface parking. The scheme designed by Morgan Design Studio had merit but was refused by the Purbeck District Council over concerns regarding (i) the impact of the proposed development on the character and appearance of the area; and (ii) the effect on the living conditions of neighbouring occupiers with particular reference to noise and disturbance. Darryl wrote a comprehensive appeal statement justifying the scheme in light of adopted planning policies and refuting the reasons for refusal. In the decision letter, the Planning Inspector agreed with Darryl that the quantum, size and massing of the proposed development accorded with the development within the locality and that backland development in itself would not be materially harmful as it is becoming part of the character of the area. In respect of the alleged noise and disturbance, Darryl successfully argued that proposed boundary treatment would be sufficient to prevent harm and given the previous of the site was a shop, it was unlikely that additional noise over and above that use would be created by the proposals despite the greater intensification in terms of housing numbers and commercial use. If you have been refused planning permission and need honest advice as to the best approach to overcome those reasons for refusal, either by the submission of a revised planning application or the appeal route, then please call Pure Town Planning on 01202 585524 or email info@puretownplanning.co.uk.